A research team was able to switch the magnetic handedness of an iron pair between left- and right-handed. A team of researchers from the Department of Physics at Hamburg University, together with colleagues from the Radboud university in Nijmegen, the FZ J lich and the MPI of Solid State Research in Stuttgart, explored the atomistic origin of magnetization handedness in a structure containing as few as two iron atoms on a platinum crystal surface and they were able to controllably switch the magnetization of the iron pair back and forth from left-handed to right-handed. This unprecedented control of the magnetization might enable a future design of stable magnetic swirls, so-called skyrmions, with tailored sizes and handedness, which are being discussed as new units for information storage. Handedness is a peculiar breaking of symmetry where a mirror image of a structure or pattern is different from its original. While the most well-known example is our own hand, which gave the name to this kind of asymmetry, there are many other materials or structures known from different disciplines of natural sciences which show handedness: Amino acids and sugars, snail shells, and swirls of the magnetization, so called skyrmions, which have recently been heavily investigated because of their promise as new units for the storage of bits in information technology. In all of these structures, we can differentiate righties and lefties, which are mirror images of each other. While in some of these examples lefties and righties are almost equally represented in nature, in many others one sort of handedness is dominating. Scientists have since wondered about the possible origin of this so called homo-chirality, and it has been even proposed that evolutionary processes are responsible for handedness in some systems. The Hamburg research team has now explored the source of magnetic handedness in the smallest possible units. By observing a pair of iron atoms, which are lying on a platinum crystal, with a scanning tunneling microscope (see Figure) they were able to deduce a clockwise rotation of the magnetization, i.e. the pair is right-handed. Moreover, moving the right atom by only one atomic diameter farther apart from the left atom changes the rotation of the magnetization from clockwise to anti-clockwise, i.e. the pair gets left-handed. Together with the theory group of the Forschungszentrum Julich, the team was able to show that the mechanism responsible for this handedness is a magnetic handshake between the two atoms mediated by the platinum substrate atoms (see the Figure). The researchers now hope that they can use the tip of the scanning tunneling microscope as a tool in order to build lattices of hundreds of such iron atoms, which might then host left- or right-handed skyrmions. 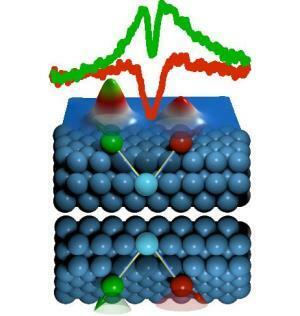 Tailoring the chiral magnetic interaction between two individual atoms.